They are using the Katrina model in Puerto Rico to close schools | Fight Back! 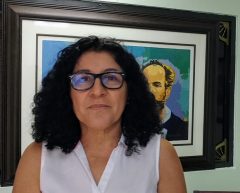 Eulalia “Laly” Centeno was interviewed Oct. 23 at the Puerto Rican Teachers Federation office in San Juan, Puerto Rico. Centeno is a teacher at the Salvador Brau Elementary School in Cayey and active with the Puerto Rican Teachers Federation. She talks about the danger of the government using the crisis of Hurricane Maria to impose massive school closings and privatize public education in Puerto Rico - as they’ve tried to do for years but have not been able to because of resistance from teachers and the community. She warns that the government is using the model that was used in New Orleans after Hurricane Katrina, when public schools were closed en masse and changed to privatized charter schools. Interview and translation into English by Brad Sigal. Fight Back! : Can you tell us who you are and what’s happening with your school? Eulalia Centeno: I’m Eulalia Centeno Ramos, better known as Laly Centeno. I’m a teacher and affiliated with the Puerto Rican Teachers Federation (FMPR). I’m an elementary school teacher at the school called Salvador Brau, which is a K-6 school. In this difficult moment that the country is living through, the school where I work is in the best possible condition because it has electricity, it has water, and it’s clean because the teachers and workers of the school did all the cleaning. We got everything ready. We organized the program to welcome back students and start the academic process. All areas are ready to start classes. But then the Education Secretary announced that in this school, this town, this region, classes won’t start until the Commission of Engineers from the U.S. comes and certifies it. They are saying that for now the students aren’t allowed to be in the school. But the workers, all the workers are in the school! I can’t understand that. What makes us think that the government has a plan with the intention to get more money out of FEMA and is projecting to close schools and eventually merge them is that this already was the plan that the Fiscal Control Board had. Now Hurricane Maria has just opened the doors for them to come in and undo everything and play with the emotional state and conditions of our children, our parents, our staff, so that they can impose school closings and eliminate teachers from the system. With our children living in the subhuman conditions in which we’re living in terms of health and security they even said we couldn’t use the school kitchens in our schools in the center of the island to provide food for the people. Because of all this, it’s clear they want to do long-term school closings so they’re being very selective about which schools to reopen first because this would be a new class cycle. They’re being very selective and that way they can close schools and provide ‘alternatives’ to the children of our country. Fight Back! : And these school closings are part of a privatization agenda, like what happened after Hurricane Katrina? Centeno: Yes, they want to go through a process of privatization. Yes. Because what happened with Katrina, they have established in writing that they are using the Katrina model here in Puerto Rico. Already, right now, they are offering the public school up to the association of private schools to use the buildings of the public schools. They are ready to give them over to them so they can use them. But they are not opening the schools up to the people in the same way. The most lamentable part of all this is that the [other] union that is supposed to represent teachers, the Association of Teachers, is being complicit in this process of school closings, of privatization of the schools in the country. It’s in writing and the governor and education secretary have said that the model they’re using is the Katrina model from New Orleans and we know this is what happened there. So we in the Puerto Rican Teachers Federation are alerting the country, we’re alerting parents, we’re alerting the community that we can not allow this. What they are doing is not helping the country, it’s for the benefit of a few rich people using the needs of the people to do it.